Tags: Hand Dug Wells, Handpumps, Spring Protection, Water Prospection and Investigation, and Water Quality Testing and Surveillance. Organisations: SDC. Categories: Training Materials. Close to half a million refugees live in Dadaab, Kenya and rely on groundwater from the Merti Aquifer. Preliminary hydrogeological mapping indicates over exploitation of the fresh water aquifer could result in salt water intrusion, which would put the security of water supply for the refugee camps and host population at risk. 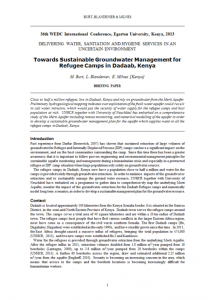 UNHCR together with University of Neuchâtel has embarked on a comprehensive study of the Merti Aquifer including remote monitoring, and numerical modelling of the aquifer in order to develop a sustainable groundwater management plan for the aquifer which supplies water to all the refugee camps in Dadaab, Kenya. Tags: Boreholes, Boreholes, Drilling, Drilling, Groundwater, Water Supply, and Water Supply. Locations: Africa, Dadaab, East and Horn of Africa, and Kenya. Languages: English and English. Organisations: UNHCR, UNHCR, and WEDC. 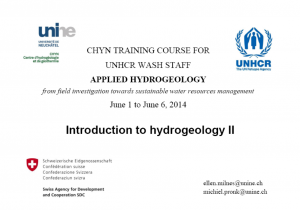 Categories: WASH Reference Documents, WASH Reference Documents, and WASH Research Documents.